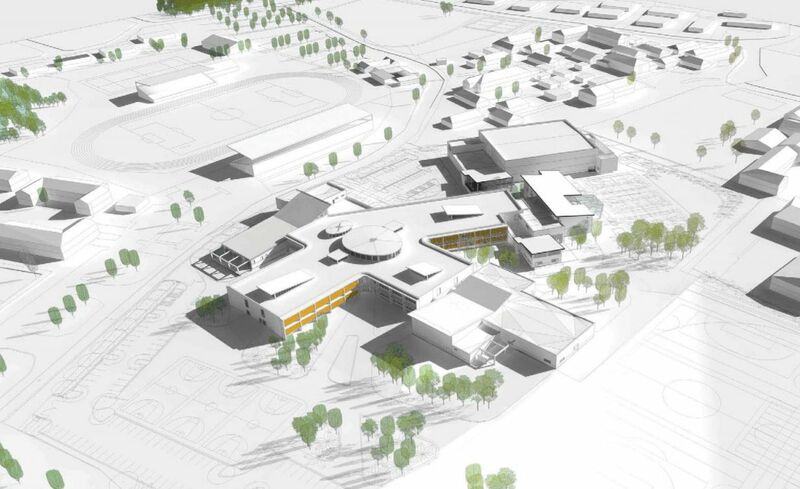 (CNS): Ten years since the groundbreaking of the John Gray High School campus project, which was followed by a catalog of problems with the contractors at the time, the proposed redevelopment is back on the government’s agenda. Local contractors wanting to bid on the construction project were recently invited to an engagement day recently to outline the expanded project, which officials said will create a new education complex at the George Town site. Education Minister Juliana O’Connor-Connolly told the potential bidders that the new school was designed to provide “improved teaching spaces that encourage dynamic teaching and enable multiple learning experiences”. Government has not revealed the projected costs for the new development but said KPMG was conducting an outline business case that will be presented to Cabinet for approval in September, with procurement expected to commence in October. The minister said the revised school development is a top priority for the government and will meet its policy of creating the “best education opportunities for all our children”. She told the contractors that she wanted them to approach it with value for money in mind but with creativity and passion, as it was as an important component of nation building. The project has been re-envisioned and expanded, and the master plan includes three projects. Project A completes the new JGHS campus by adding to the partially constructed structures to make them into a contiguous high school building complex, which is expected to be substantially complete by March 2021, ready for the school to open in the new academic year in August 2021. Project B, which the ministry said should be substantially complete by February 2022, is the refurbishment of the existing George Hicks site, where JGHS is currently located, which will be used by the Cayman Islands Further Education Centre (CIFEC), DES Student Services, Corner Stones, Parenting and Pregnant Teens and the UCCI. The old John Gray building, which now houses CIFEC, will be demolished. 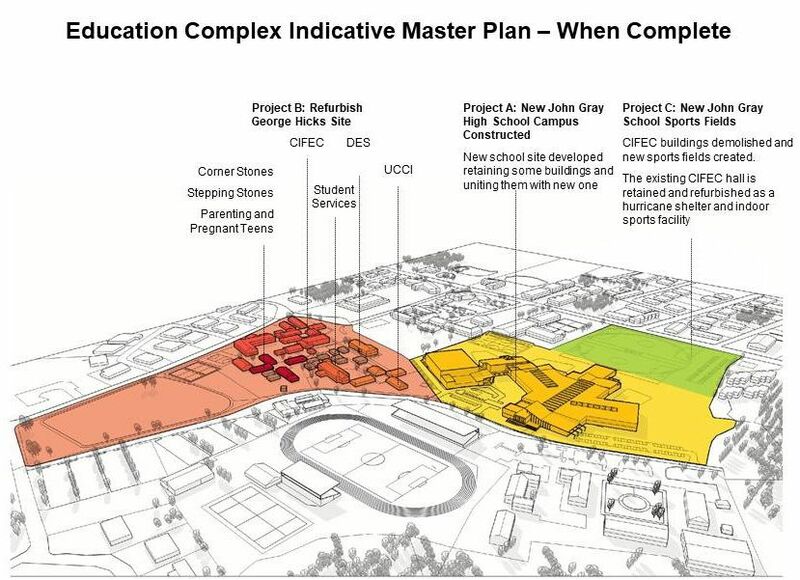 Finally, Project C will see the current CIFEC site demolished and the new JGHS sports field in its place by September 2022. The minister said the new design would help mitigate some of the challenges that the current JGHS school site poses for students and teachers. The plans reflect new school designs “benchmarked in other high-performing jurisdictions”, she said. “This modern design also takes the best from the schools here in Cayman, providing a learning environment that is right for our people and our culture,” the minister told the contractors. She added that the new campus would also be “secure and safe with high visibility and lines of sight that will allow for the better management of students”. Jonathan Matthews, Senior Project Manager of PWD Major Projects Office and Ministry of Education, explained that the new plan is based on research “connecting school design with improved educational outcomes and on extensive input from all stakeholders, including teachers, students and parents”. He said that from the start it was determined that the revised design should be functional and practical, paying less attention to empty architectural elegance. Matthews also revealed that the new design is custom-built for the actual users of the school based on their feedback. Geared to providing improved teaching conditions and to work with an optimised curriculum model, the new design will offer better opportunities for “improving student performance and increasing engagement”, he added. The contractors received presentations on each of the projects and the bidding process, including what would be required from them. Interviews were also held with contractors to get feedback on the procurement routes available, and to help in the selection of the optimum procurement route, officials said. The contractors also toured the project site as part of the engagement day activities. The JGHS project has been plagued with issues and problems for the past decade and government spent millions on trying to get the project back on track after the original contractors, Tom Jones International, walked off the job back in 2009. The costs dispute involved subcontractors as well as other factors, but most construction experts who have weighed in on the subject believed the problems ultimately came down to the fact that the original bid was far too low for the original proposed school campus design. A new school, strict adherence to uniform policy, a minister that thinks God gave her the money to give teachers a minimum wage, then her squarely already shifting the blame to the Ministry of Education should these fail to improve educational outcomes. What could possibly go wrong. I kinda think that the size of the 600 School Teachers , and that number do not include private school Teachers, are a little over populated for the size population of Cayman Islands. I might be wrong , but what do you think. Just like they did at the build of Clifton Hunter, people arrived EVERY Friday to pick up brown envelopes with money for work they were not doing nor employed to do. Same clowns, same circus, same results. Only a fool would take on that project and expect to get paid. Does this Minister know what she is saying and doing . I read alot of expenses begging and pleading with bidders . I think that we are going to end up with a School that will be big enough for 200,000 students, and bankrupting the Island before it is finished. I believe that she should go back to the Brac and operate the roller . Not that I am against the children having real good schools so that they can get the education that every kid/child deserves, I want them to . But how the Minister talked about the school, I have to believe she seems to be more interested in building a big and fancy school and spending lots of money on it . I wonder if she know that it’s not the building that educates the children , and that if there’s bad Teacher inside , the kids would come out dumber than the door they walked in through. No she does not know nor cares. Yesterday, at our return to work welcome she made several nonsense statements, including she had arranged a three day maths conference such was her concern for mathematics in the Cayman Islands. I distinctly remember the previous Minister announcing this conference. Such conferences have a two year lead in time whilst she was only elected in May 2016. Clearly she has not done the maths lol. Start from scratch. The entire design and open concept is flawed. 10 years.?. 10 years?? What a joke. If you represent government at any level, you have to be embarrassed by this. We’re not talking about a cruise port project or building some super highway, we’re talking about our children and their education. Just like every other major project here, It’s poorly forecasted and badly managed, all with little or no oversight. This school has waited 10 years to be developed yet our CIG can build some dumb boardwalk in less than a year for how many mill? SMH! I’ll believe it when I see it. Here’s to another 10 year wait folks. I’m all for getting this finished, but spare me the political gibberish. Is the design different from the Clifton Hunter’s? I am asking as I know that teachers there had a lot of problems adapting to the open classrooms — foisted on them without adequate preparation. “connecting school design with improved educational outcomes and on extensive input from all stakeholders, including teachers, students and parents”. He said that from the start it was determined that the revised design should be functional and practical, paying less attention to empty architectural elegance. Does this mean what it says? Or is this a mirror of Clifton Hunter? Just let DART/DECCO build it on time and on budget. Dart/Decco subcontract all of their work. I’m not saying we don’t need good schools, but are the buildings really the root cause of the problem? Can we possibly consider what it would take to attract world class educators to our beautiful island? It might be a case of you get what you pay for. Corrupt government = no vision. Absolutely correct. That’s why nothing of substance got done back when we did have a totally corrupt government. Only crooks do business with crooks. Well, a lack of moldy old classrooms would help. There are world class Caymanian teachers already living here. The curriculum is a mess, the grading system inconsistent and so on. So recruiting world class teachers to teach in the current educational system would lead no where. Will it include free paving for the potential bidders? 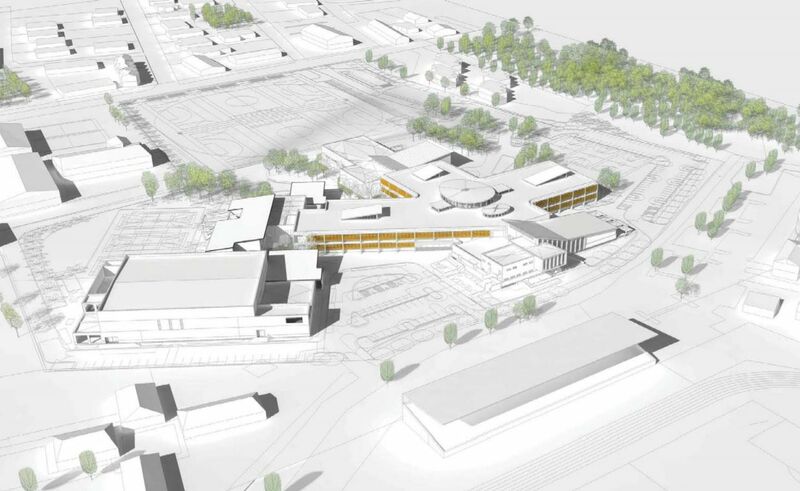 I’m now looking forward to revisiting the John Gray High School campus once completed.